The 6.5×55mm Swedish (designated as the 6.5×55 Swedish by the SAAMI and 6,5 × 55 SE by the C.I.P.) is a first-generation smokeless powder rimless bottlenecked rifle cartridge. Other common names for this cartridge include 6.5×55mm and 6.5×55mm Swedish Mauser and less commonly 6.5×55mm Mauser and 6.5×55mm Krag. It was developed in 1891 for use in the new service rifles then under consideration by the United Kingdoms of Sweden and Norway. The two nations had independent armies and consequently the normal procedure at the time was for their respective governments to use the same ammunition and then purchase small arms of their choice. Norway adopted the Krag–Jørgensen rifle, while Sweden adopted a Mauser rifle design. The 6.5×55mm Swedish cartridge has a smaller bullet diameter and lower free recoil than other full-power service rifle cartridges like the .30-06 Springfield and 7.92×57mm Mauser, but thanks in part to its relatively roomy case with an uncommon 12.2 mm (0.480 in) diameter bolt face which was designed for loading long, heavy 6.5 mm bullets, has proven more successful than other first-generation smokeless-powder military cartridges of similar caliber such as the 6×60mm US Navy, 6.5×54mm Mannlicher–Schönauer, 6.5×53mmR Dutch Mannlicher, 6.5×52mm Carcano and 6.5×50mm Arisaka. The Swedish-Norwegian Rifle Commission started its work in 1891. After extensive ballistic tests where different calibers were tested (8 mm, 7.5 mm, 7 mm, 6.5 mm etc. ), the optimal caliber was determined to be 6.5 mm (0.256 in). Following this decision, a joint Norwegian-Swedish commission was established in December 1893. This commission worked through a series of meetings to decide on the different measurements for the cartridge case. A rimless cartridge case of 55 mm length was approved, and each possible measurement (diameter at base, diameter at neck, angle of case, angle of shoulder etc.) was decided upon. The corresponding dimensions of the cartridge chamber to be used in a future service rifle was also determined. The 6.5×55mm has 3.75 ml (57.9 grains H2O) cartridge case capacity. The exterior shape of the case was designed to promote reliable case feeding and extraction in bolt action rifles and machine guns alike, under extreme conditions. 6.5×55mm maximum C.I.P. cartridge dimensions. All sizes in millimeters (mm). Americans would define the shoulder angle at alpha/2 ≈ 25.6 degrees. The common rifling twist rate for this cartridge is 220 mm (1 in 8.66 in), 4 grooves, Ø lands = 6.50 mm (0.256 in), Ø grooves = 6.73 mm (0.265 in), land width = 2.5 mm (0.098 in), and the primer type is large rifle. According to the official C.I.P. (Commission Internationale Permanente pour l'Epreuve des Armes à Feu Portatives) rulings the 6.5×55mm can handle up to 380.00 MPa (55,114 psi) Pmax piezo pressure. In C.I.P. regulated countries every rifle cartridge combo has to be proofed at 125% of this maximum C.I.P. pressure to certify for sale to consumers. This means that 6.5×55mm chambered arms in C.I.P. regulated countries are currently (2013) proof tested at 475.00 MPa (68,893 psi) PE piezo pressure. The German 6.5×57mm Mauser and the American .260 Remington cartridges are probably the closest European and American ballistic twins of the 6.5×55mm. 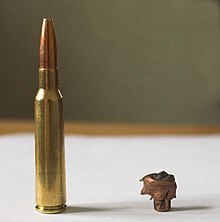 The .260 Remington being a post World War II .308 Winchester-derived cartridge developed by Remington to provide 6.5×55mm performance in a short bolt action format. In the 21st century cartridges like the 6.5×47mm Lapua and the 6.5mm Creedmoor have entered the market that also provide similar performance. The SAAMI maximum average pressure (MAP) for this cartridge is 51,000 psi (351.6 MPa) piezo pressure (46,000 CUP). 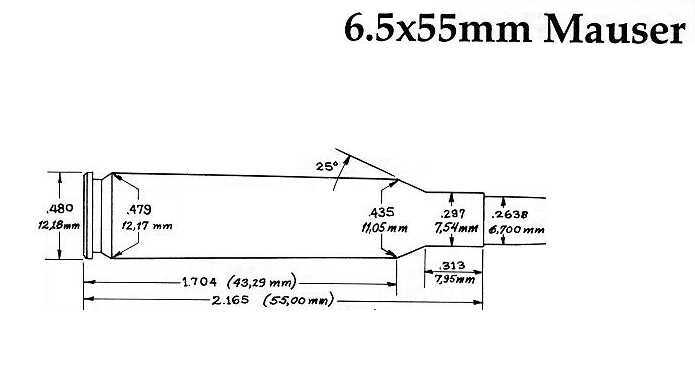 All Swedish Mauser bolt actions were proof tested with a single 6.5×55mm proof round developing approximately 455 MPa (65,992 psi) piezo pressure (55,000 CUP). Some historians have assumed that there was a difference in cartridge blueprint measurements between Swedish and Norwegian 6.5×55mm ammunition, but this may be unintentional. Due to different interpretations of the blueprint standard, i.e. the standards of manufacturing using maximum chamber in the Krag vs. minimum chamber in the Swedish Mauser, a small percentage of the ammunition produced in Norway proved to be slightly oversize when chambered in the Swedish Mauser action, i.e. requiring a push on the bolt handle to chamber in the Swedish arm. A rumour arose not long after the 6.5×55mm cartridge was adopted that one could use Swedish ammunition in Norwegian rifles, but not Norwegian ammunition in Swedish rifles. Some even alleged that this incompatibility was deliberate, to give Norway the tactical advantage of using captured ammunition in a war, while denying the same advantage to Sweden. However, after the rumour first surfaced in 1900, the issue was examined by the Swedish military. They declared the difference to be insignificant, and that both the Swedish and Norwegian ammunition were within the specified parameters laid down. Despite this finding, the Swedish weapon-historian Josef Alm repeated the rumour in a book in the 1930s, leading many to believe that there was a significant difference between the ammunition manufactured in Norway and Sweden. The militaries of Sweden and Norway loaded their 6.5×55mm skarp patron m/94 projektil m/94 (live cartridge m/94 projectile m/94) service ammunition with a 10.1 grams (156 gr) long round-nosed m/94 (B-projectile) bullet fired at a muzzle velocity of 725 m/s (2,379 ft/s) with 2,654 J (1,957 ft⋅lbf) muzzle energy from a 739 mm (29.1 in) long barrel up to the early phase of World War II and Norwegian occupation by Germany in 1940. From 1941 onwards, Sweden, which remained neutral during World War II, adopted skarp patron m/94 prickskytte m/41 (live cartridge m/94 sniping m/41) ammunition loaded with a 9.1 grams (140 gr) spitzer bullet (D-projectile) fired at a muzzle velocity of 800 m/s (2,625 ft/s) with 2,912 J (2,148 ft⋅lbf) muzzle energy from a 739 mm (29.1 in) long barrel. Besides a pointed nose the m/41 D-projectile also had a boat tail. Originally developed for the m/41 sniper rifle, this new cartridge replaced the m/94 ammunition loaded with the M/94 projectile for general use. Besides the two skarp patron (live full metal jacket ball cartridge) variants various other military 6.5×55mm ammunition types like enhanced precision, armor piercing, tracer, blank, inert and training cartridges were available. Swedish blanks or lös patron were loaded with bullet shaped wooden projectiles that were painted red. To fire these blanks the Swedish military used a Blank Firing Attachment (BFA). These adapters were mounted on the muzzle and designed to shred the wooden projectile as it exited the muzzle to prevent injuries to nearby people and to allow functioning of automatic weapons. The Swedish 6.5×55mm military ammunition was loaded to 320 MPa (46,412 psi) piezo pressure. The maximum pressure (Pmax) for Swedish military ammunition was 330 MPa (47,862 psi). That is significantly below the civilian (Pmax) standards. The 6.5×55mm cartridge was used by Norway in the Krag–Jørgensen bolt-action rifle and in the Madsen machine gun, as well as in several prototype self-loading rifles. In Swedish service, the 6.5×55mm cartridge was used in the Swedish Mauser family of bolt action arms comprising the m/94 (Model 1894) carbine, m/96 (Model 1896) long rifle, m/38 (Model 1938) short rifle and m/41 (Model 1941) sniper rifle and the Ag m/42 semi-automatic rifle. The Swedish Mauser arms had a relatively tight 200 mm (1 in 7.87 in) twist rate optimized for stabilizing the relatively long heavy bullets used in the Swedish 6.5×55mm military service ammunition. It was also used in several light, medium and heavy machine guns such as the Schwarzlose, Browning BAR, Kg/1940 Light machine gun, Bren Gun, Browning M1917, Browning M1919 and FN MAG. The FN MAG was eventually returned to its original 7.62×51mm NATO chambering when the Swedish armed forces switched to that cartridge as its standard during the post-World War II era. Expanding bullet loaded in a 6.5×55mm before and after expanding. The long base and small expanded diameter show that this is a bullet designed for deep penetration on large game. The bullet in the photo traveled more than halfway through a moose before coming to rest, performing as designed. The 6.5×55mm cartridge is highly esteemed as a hunting round in Europe (particularly in Scandinavia), and North America. It is used for killing most kind of game including reindeer and moose in Scandinavia, while in most other countries it is used for killing deer and other medium-sized game. Sportsmen who favor the round laud the combination of low recoil coupled with the cartridge's inherent accuracy and superb penetrative qualities due to the high obtainable sectional density. Despite its enduring popularity amongst a devoted niche of American sportsmen, U.S. rifle manufacturers have, for the most part, ignored the cartridge. There are, however, at present at least four mainstream American arms manufacturers, Thompson Center, Barrett Firearms (Fieldcraft), Remington (Model 700), and Ruger producing a sporting rifle in chambered for the 6.5×55mm. European rifle makers including Blaser, CZ, Sauer & Sohn, Steyr, and Mauser Jagdwaffen GmbH offer sporting rifles chambered for this cartridge, as does the Finnish arms manufacturer SAKO/Tikka, and Japanese manufacturer Howa, while ammunition manufacturers such as Norma, Lapua, Prvi Partizan, RUAG Ammotec, Remington Arms, and Hornady offer loadings of the 6.5×55mm round that are designed for use only in modern hunting rifles that can tolerate higher chamber pressures. Finnish powder manufacturer Vihtavuori warns modern 380.00 MPa (55,114 psi) Pmax piezo pressure loadings should never be used in the Krag–Jørgensen or Swedish Mauser or similar older rifles. This warning is relevant as the Danish, Norwegian and Swedish national shooting organizations strive to keep the costs of participating in their shooting events reasonable. Their rulings restrict the use of very expensive highly specialized target rifles by allowing only the use of their respective (historic) military service rifles and the Sauer 200 STR rifle. Because 6.5 mm (.264") bullets have relatively high ballistic coefficients, the 6.5×55mm has seen success in long range target matches of 300 m (328 yd) – 1,000 m (1,094 yd). The 6.5×55mm cartridge was widely used in biathlon competition until 1975 (when it was replaced by the .22 Long Rifle (.22 LR) rimfire cartridge), because of its inherent accuracy and historical popularity with the Scandinavian nations who have dominated this sport.The 6.5×55mm was and is used for 1,000 yd (914.4 m) target shooting disciplines like F class and benchrest. The cartridge is also used by Scandinavian target shooters that use the Sauer 200 STR (Scandinavian Target Rifle) as their competition rifle. Metallic silhouette shooters also use the 6.5×55mm. In North America the 6.5×55mm was the third most frequently mentioned caliber for hunter rifle at the 2003 Metallic silhouette Nationals. The 6.5×55mm case is also used as the parent case for modified variants that are not officially registered with or sanctioned by C.I.P. or its American equivalent, SAAMI. Such cartridges which use commercial factory cases are generally known as wildcats. By changing the shape of standard factory cases (decreasing case taper or changing the shoulder geometry) the wildcatter generally increases the case capacity of the factory parent cartridge case, allowing more propellant to be used to generate higher velocities. Besides changing the shape and internal volume of the parent cartridge case, wildcatters also can change the original calibre. A reason to change the original calibre can be to comply with a minimal permitted calibre or bullet weight for the legal hunting of certain species of game. Because the 6.5×55mm offers a relatively wide short cartridge case that can be relatively easily reloaded and hence be reused several times it has been used by wildcatters. With the 6.5×55mm as the parent case wildcatters have created the 6.5×55mm Ackley Improved In the 6.5×55mm Ackley Improved the cartridge case capacity is raised to approximately 4.03 ml (62.2 grains H2O). The Ackley Improved family of wildcat cartridges are designed to be easily made by rechambering existing firearms, and fireforming the ammunition to decrease body taper and increase shoulder angle, resulting in a higher case capacity. ^ "6.5x55mm Swedish Mauser". Hodgdon Reloading. Archived from the original on 5 April 2019. Retrieved 5 April 2019. ^ "RWS 6,5 x 55 DK 9,1G data sheet" (PDF). RWS. Archived (PDF) from the original on 5 April 2019. Retrieved 5 April 2019. ^ "RWS 6,5 x 55 EVO 10,1 G data sheet" (PDF). RWS. Archived (PDF) from the original on 5 April 2019. Retrieved 5 April 2019. ^ "A Metric Marvel: 6.5×55 Swedish Mauser". shootingtimes.com. Archived from the original on 1 February 2017. Retrieved 8 March 2017. ^ "6.5x55". ballisticstudies.com. Archived from the original on 17 August 2013. Retrieved 8 March 2017. ^ "6.5x55 Ammunition". dutchman.rebooty.com. Archived from the original on 8 March 2017. Retrieved 8 March 2017. ^ Jones, D: Crown Jewels: The Mauser in Sweden, pp. 37, 59, 81, 93. Collector Grade Publications, 2003. ^ "Venture bolt-action rifle". Archived from the original on 26 August 2014. Retrieved 23 August 2014. ^ "6,5 x 55 SE / 6,5 x 55 SKAN". vihtavuori.com. Archived from the original on 12 March 2017. Retrieved 8 March 2017. ^ "Tikka". Archived from the original on 23 March 2017. Retrieved 20 March 2017. ^ "Lapua". Archived from the original on 23 March 2017. Retrieved 20 March 2017. ^ "Michigan Rifle & Pistol Association - Rifle Silhouette Division". Archived from the original on 17 February 2017. Retrieved 20 March 2017. Wikimedia Commons has media related to 6.5×55 Swedish.